This worldwide supplied product provides a convenient, efficient and inexpensive method for forming base-metal thermocouple sensing junctions in all foundry and molten metal temperature measurement operations. Quick Tip Connectors are individually low in cost and with a portable hand-held or bench mounted crimping tool an inexperienced operator can easily form a consistently uniform thermocouple junction time after time. Labour rates are reduced and hazardous welding operations are no longer required. 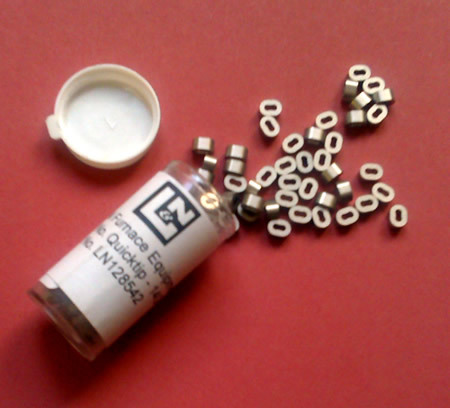 Quick Tip Connectors are available in bottles of 100 No. connectors in thermocouple type E-J-K or T in three gauges. In addition we can provide an economic and accurate means of temperature measurement with standard thermocouple wires bare and insulated available in a number of sizes and calibration. All are manufactured to rigid specifications to obtain the desired chemical, physical and electrical properties. Extension Wires are also available with various insulations to meet your specific temperature applications.